If there’s one thing that Star Trek likes to do, it’s stereotype its races. The Ferengi are all money loving, the Vulcans live purely by logic and the Klingons are all warmongers. Do the Ferengi really never do anything unless there’s profit to be made? Do the Vulcans never do anything without a logical reason? And do the Klingons really have no fun pastimes apart from their so-called opera and a bit of (un)friendly fighting? We think there’s more depth to these races than meets the eye. It’s just that they don’t necessarily show that depth to the tourists, or the TV cameras. 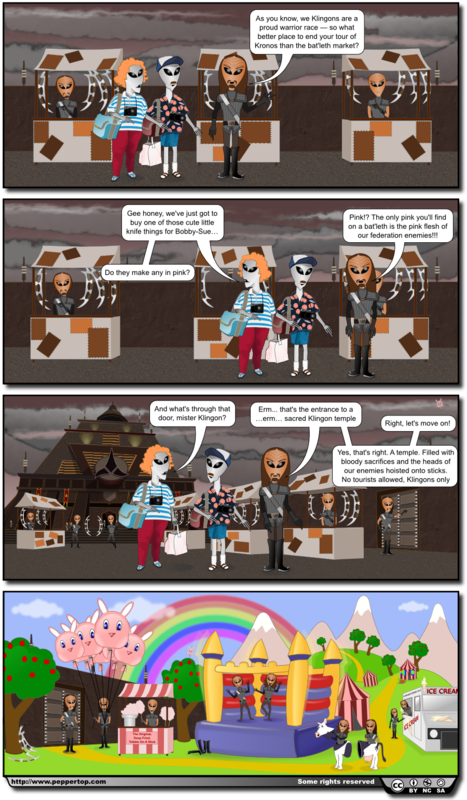 Klingon: As you know, we Klingons are a proud warrior race — so what better place to end your tour of Kronos than the bat'leth market? Do they make any in pink? Klingon: Pink!? The only pink you'll find on a bat'leth is the pink flesh of our federation enemies!!! Tourist: And what's through that door, mister Klingon? Klingon: Erm... that's the entrance to a …erm… sacred Klingon temple. Great! I really like the look of the Klingon playground, particularly deep fried Tribble!